Autumn 2018 The development is now complete with most houses occupied. It is to be known as The Moorings – how ironic then that Canal & River Trust (CRT) (who own and manage the canal) have banned the mooring of boats along this frontage! So much for developing and encouraging the use of the waterway asset. End 2017 All houses under construction. August 2016 Construction on the site has begun. 5 August 2015 The site has been sold to Henderson Homes (UK) Ltd. and they have submitted a new planning application CEC 15/3461M , once again for 7 properties. The number will no doubt be objected to once again. The pictures on their web page show the previous application. August 2014 Planning permission granted for the 6 house proposal (13/5259M ). Work due to start Jan 2015 (it never did although the site was cleared). December 2013 H2O are working to submit a new application before Christmas. This will be for 6 units, rather than 7, and with just one access from Hurst Lane. They will increase the distance between the new houses and the end house on Highfield Road, and avoid the overlooking of the house in the quarry on Palmerston Street. 19 June 2013 The planning application has been withdrawn! Reason not yet known. On 23rd April 2013 the developer, H2O Urban, has submitted a Planning Application to CEC and issued artist’s impressions together with a press release on their plans for this site. Hurst Lane canal wharf was last occupied by Red Joinery. The site was owned by Canal & River Trust (CRT) , a charity created out of British Waterways. CRT have taken over all responsibilities for the development and upkeep of the English and Welsh inland waterways that previously belonged to British Waterways – the difference is that they are now a charity, run in a similar manner to the National Trust. A further organisation, called H2O, was set up by CRT. This is a national joint venture partnership between CRT and specialist developers bloc. One of CRT’s responsibilities is to maximise their income from their property holdings. CRT decided to re-develop the wharf by building houses. 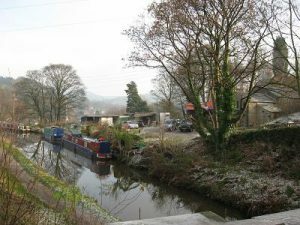 They recognised the sensitivity of the site – it is a prominent location beside the Macclesfield canal, and within the Macclesfield Canal Conservation Area. With this sensitivity in mind, H2O held a Public Consultation at the Civic Hall in October 2012. Representatives from CRT, H2O and bloc were in attendance to discuss community concerns and to answer questions. In January 2013 H2O returned with updated plans, reflecting the comments made in October. These plans were presented to the Civic Society committee and to Bollington Town Council, whose meeting was attended by about 20 members of the local community. The new proposal was for seven units, three detached and two pairs, (this is one less than the earlier proposal). Changes were made to the individual house designs to keep the roof lines down to two stories from each direction. The entrance to the site had been moved a few metres further up Hurst Lane from the present entrance in order to improve access/egress safety. One pair of houses would front Hurst Lane with their own entrance from Hurst Lane towards the top of the site. The five houses in the main body of the site were arranged around a square courtyard with an open side to the canal. There was to be space on the wharf for two boats and the moorings were intended to be fully serviced (power and water). All originally moored boats were to be relocated during the construction phase. Comments from the community included: concerns about traffic, particularly during construction, and the ongoing parking problems – parking space on Hurst Lane would be reduced by the two entrances proposed; there was a call for a weight limit to be applied to the canal bridge in order to prevent deliveries being made to the site; the effect on Aqueduct Cottage of overlooking by the house immediately opposite. It should be said that the general consensus was that the development would be an improvement to the area and that most concerns had been answered. Further changes were later made which reduced the number of units to six and an application was made to CEC (13/5259M ) on this basis. Permission was granted in August 2014. It was later announced that construction would begin in January 2015. Nothing happened. In August 2015 we hear that the site has been sold to Henderson Homes (UK) Ltd. and that they have submitted a new planning application, 15/3461M . This is again for 7 units, five accessed from the new roadway and two directly from Hurst Lane. Building commenced shortly after that. However, it appears that the project has been sold on because Henderson’s appear no longer to be in business.